For this episode I’m joined in studio by Alison, Tim, and former Animal Voices host, Aylon. William Housty, from the Heiltsuk Nation located around Bella Bella, has a bachelor’s degree in natural resource management. He speaks with us about the Coastal First Nation’s joint decision to enforce their ban on trophy bear hunting. The brand new informative website, pledge campaign, and stunning video seen below are from Bears Forever, a project of the Central Coast First Nations Bear Working Group. Be sure to visit the website to learn more and to sign the pledge. The members of the Animal Voices collective seek to act in solidarity with First Nations peoples in standing up against the grizzly hunt, honouring this fragile coastal region, and supporting Indigenous rights. We speak with Fletch who is an organizer with Rising Tide Vancouver Coast Salish Territories, a grassroots environmental justice group committed to fighting the root causes of climate change and the interconnected destruction of land, water, and air. 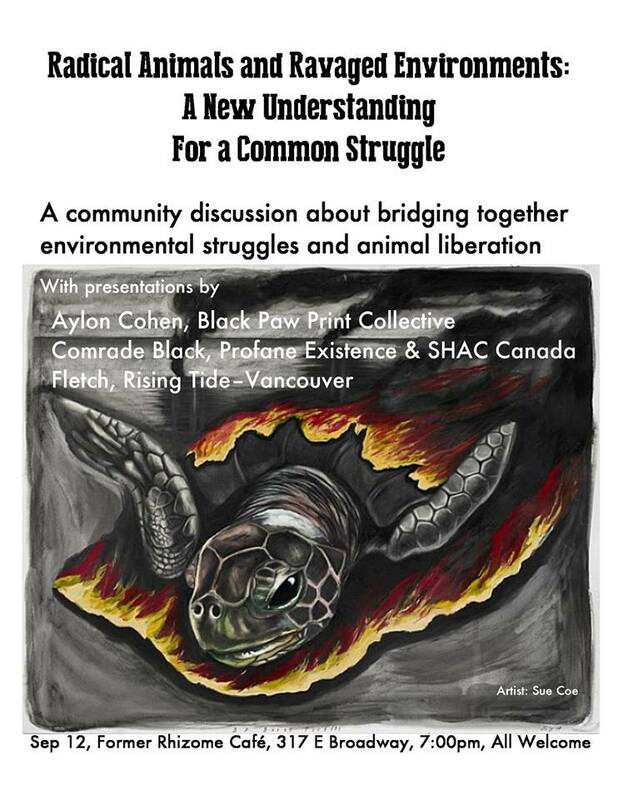 He is teaming up with the Black Pawprint Collective (an anarch@-feminist collective devoted to total animal, environmental, and human liberation through direct action and education) to present a community dialogue event. We anticipate a well-attended evening and look forward to some challenging and fruitful discussion.